Prema Sai Baba, 2030-2116 A.D.
A living chronological account of the history of Sathya Sai Baba's life on Planet Earth, the second of the triple incarnations of the Sai Baba Avatar and the promised Golden Age. World History after 1900, or World History before 1900. Choose and & Listen to God's singing. 2022 Age 96, Lord Sai Baba leaves this body and enters into mahasamadhi. 2023 Swami Nalin, a reincarnated soul of Swami Vivekananda heads the Sathya Sai Organisation in the absence of Lord Sai Baba. Call him "Assistant Sai Baba". 2030 Assuming 8 years later, birth of Prema Sai in Mysore region. A reincarnated Prof. Kasturi (already borne in Mysore) is the Mother of Sai. 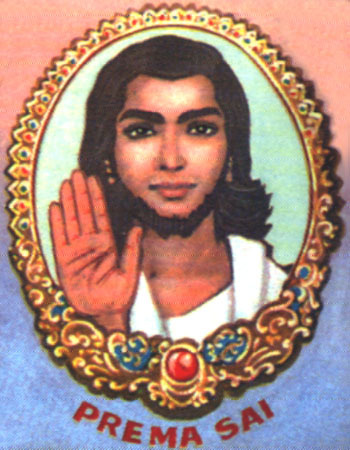 2044 Assuming age 14, Prema Sai announces his arrival, like in 1940; resumes His role as Lord of the World and continues His Divine Mission on planet Earth. Welcome to the Love Era, The goldest Golden Age. 2051 Assuming at age 21, Prema Sai gets married to a beautiful girl. Hmm hmm, many old lady devotees in the ashram now are vying for the role equivalent to Sita. 2053 Assuming age of 23, Goddess Mother will bear a son. It is common knowledge that Prema Sai will be a father to one boy. And nobody is vying for this 'small' role. 2053-2126 is a 73 years of golden times!!!! After 2126 the end of the Triple Incarnation, but is it the end of the Golden Age? Sri Sathya Sai Baba and the Future of Mankind by SP Ruhela. Is Sai Baba God? by MR Kundra. Sai Baba and Nara Narayana Gufa Ashram by Swami Maheshwaranand. God Lives in India by RK Karanjia. Sai Baba of Shirdi, a unique Saint by MV Kamath & VB Kher.